Studies say constantly relocating to new homes can have a long lasting negative impact on a child’s development. This makes transitioning into a new home quite a daunting task that requires proper prior planning. According to Dr Shegeiro Oishi a renowned psychology professor at the University Virginia, relocating to a new house is not always bad for kids provided parents take time to make their kids comfortable with the idea of moving and make arrangements to involve children in the house hunting process. This article details some of the challenges that children face when it comes to relocating to a new home and gives effective tips that come in handy in making moving a seamless and painless experience people with kids. Losing friends and peer groups - Young kids can be attached to their friends and there is no doubt many tweens and teenagers are emotionally attached to their peer groups. Relocating to a new home means abandoning relationships that they care about to start new ones in an absolutely new environment which is a very scary and nerve wrecking concept. This is particularly tough for introverted kids. Academics suffer - If moving involves changing schools then it can detrimentally affect children’s academic performance. If moving will require changing schools then this may affect the kids’ academic work as they will have to acclimatize with the new teachers and new classmates. Social issues - Due to anxiety and fear of transitioning into a new environment some kids may start acting out, withdrawing socially, and even rejecting every house they tour during house hunting no matter how great the new house is. Kids who are introverted can become very anxious and be deeply affected by the idea of relocating, to the point of becoming rude, aggressive, refusing to eat, and even refusing to get involved in the house hunting process. According to child psychologists the most effective way of alleviating the anxiety and stress that kids have when relocating to new homes is ensuring they take part in the house hunting process. The thought is to help kids become excited at the prospect of starting afresh in a new environment. Involving them in the entire moving process will also make them feel like their opinions are appreciated and valued and this will make the children have a positive attitude towards relocating. 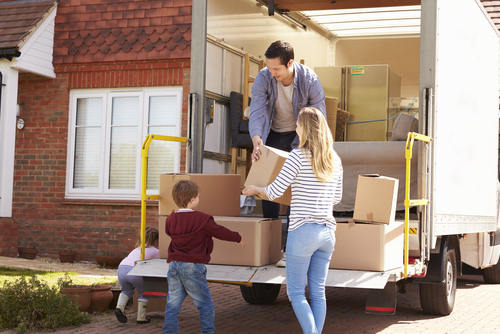 Here is a brief rundown of five effective steps that parents can take to ensure their children are fully involved in the moving process. Demystify the new environment by organizing fun trips with to the new neighborhood to enable kids familiarize with their new home. Drive to the local mall, the amusement park, or the neighboring school to show your kids that their new home is not as bad as they may be imagining. This will tremendously improve their attitude towards relocating. Organize house hunting trips that involve the kids. Contrary to popular belief that house hunting is boring for kids, it can actually be a chance for kids to deal with the reality of relocating and start accepting that they are going to a new environment. By allowing the kids to look at houses you are psychologically making them comfortable with the reality of an imminent relocation. Ensure that house hunting trips involving kids are fun and exciting. For instance organize with your real estate agent to take a break after seeing a few homes to ensure the children do not get bored or lose interest. Give your kids responsibilities that make them actively involved in the house hunting process. Spark your kids’ interest in moving to a new home by giving them house hunting tasks. For instance, teenagers can research online to have a thorough understanding of the new neighborhoods that they may move into. The younger kids can create fun collages of how they would love their new bedrooms to look like. Let kids participate in designing, arranging and furnishing their new home. This will make the very excited at the prospect of moving to a new home. After choosing a new home try and get your kids involved in activities at their new environment such as joining clubs in the new neighborhood, the local church, and even scouting activities. Inform your real estate agent of the activities that interest your kids so they find a house in a neighborhood that is kid friendly. Assist and allow your kids to stay in touch with friends at their previous neighborhood by allowing communication via telephone, email, letters, and even personal visits if possible. This will help make the transition more gradual and less shocking to your kids. Moving to a new house is not only a challenge for adults but also for kids ranging from toddlers to adolescents. It is imperative to choose a local real estate agent who will make provisions and accommodate the needs of your kids throughout the entire house hunting process.